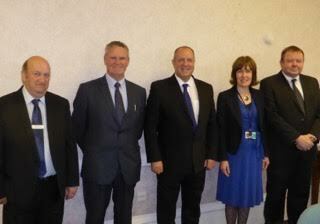 Cllr Kevin Buttery is now Leader of Amber Valley Borough Council and has announced his new Cabinet. Cllr Kevin Buttery said: “I’m hugely proud to have been chosen by my fellow councillors to lead Amber Valley Borough Council at this challenging, but exciting time. “My priorities are very much about economy, housing, skills and job creation. Cllr Trevor Ainsworth, Cabinet Member for Regeneration. He will also perform the role of Deputy Leader of the Council. Cllr Chris Short, Cabinet Member for the Environment. Cllr Jane Orton to remain as Cabinet Member for Community Safety . Cllr David Taylor, Cabinet Member for Housing and Health. The Leader further commented: “This is a team which combines new faces with an experienced frontbencher. “I am looking forward to them all starting work in their areas, whether they are taking on new responsibilities or continuing in their work’.